Coconut oil is cholesterol and trans fat-free, and is rich in medium-chain “good fats”. This centrifuged coconut oil is made from fresh coconuts (not copra), which are opened and pressed within 48 hours of being picked from the trees. Compared to other coconut oils, Coco Natura Coconut Oil has a very high content of Lauric Acid, at 57%. It is cold-pressed, unrefined, chemical-free, unhydrogenated – a pure oil! 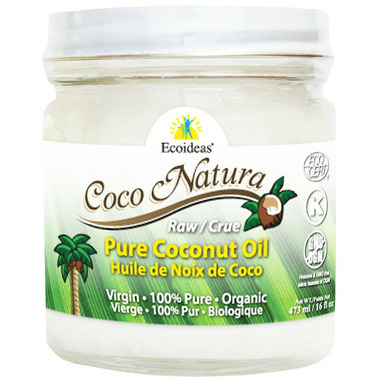 Pure Coconut Oil is RAW, Virgin, Cold-Pressed, Certified Organic, Kosher, and Additive/GMO/Gluten Free. Ingredients: Organic Raw Coconut Oil. Good for melting but unwieldly to scoop out cold. Best deal on good quality coconut oil. I would definitely recommend it to anyone. Coconut oil is very expensive. This one was the cheapest I could find and it is not bad but I sure wish it could be cheaper. Best coconut oil, better quality than nutiva and raw in a glass jar. Mexican so which is closer to us than getting it from Thailand for phillipines. I usually buy Artisana coconut oil but have tried a few others as well, and this one just didn't taste right to me. Almost tastes like it's old but it doesn't expire until 2015 so I'm just assuming that's the taste of this particular brand. If you're looking for that delicious coconut taste, this one is not recommended. Great product, perfect for raw or paleo recipes.